Posted on March 23, 2019 by Mike Sonnenberg Posted in Ghost towns, upper peninsula	. 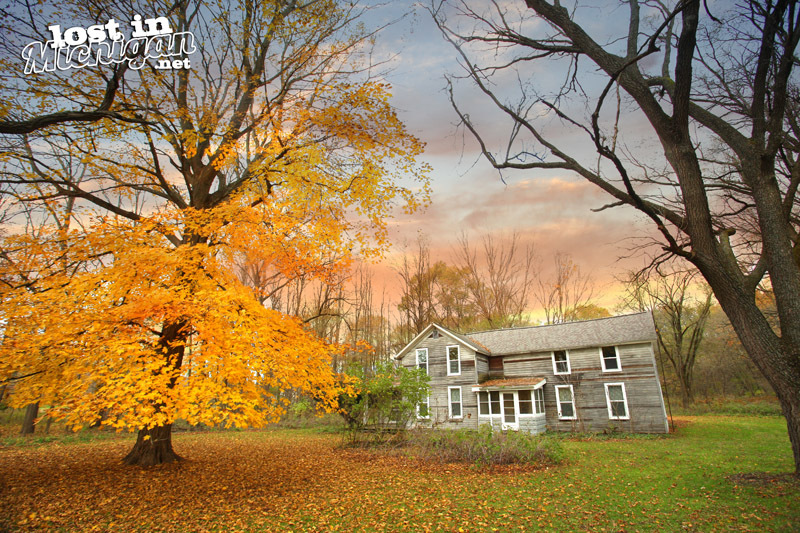 Michigan has a few lumbering and mining ghost towns scattered around the state. Near the old historic Quincy Mine north of Hancock, I saw these old forgotten houses. They are on US-41 in Franklin Township. I call them ghost houses because the area still has people living and working in it, but I assume these were old miners houses. The name of the town where these houses stand is or was Franklin Mine, named after the mine in the area. They look as if the historical society or someone is preserving them. They make me wonder about the people who lived in the Keewenaw and worked in the mines. It must have been a hard life back in the day. 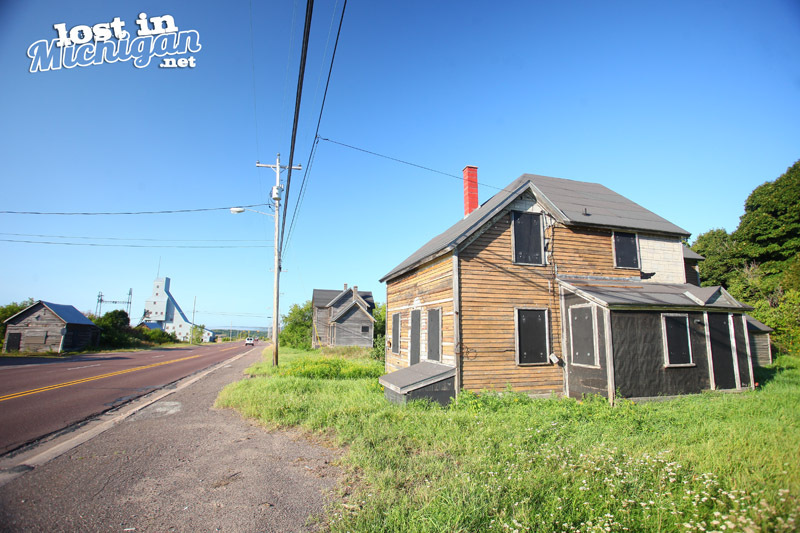 I am fascinated by the beauty and the history in the Keweenaw Peninsula and have more pics to post and stories to share. I hope you will subscribe to email notifications so you won’t miss any new posts. Posted on March 2, 2019 by Mike Sonnenberg Posted in Ghost towns, Murders	. 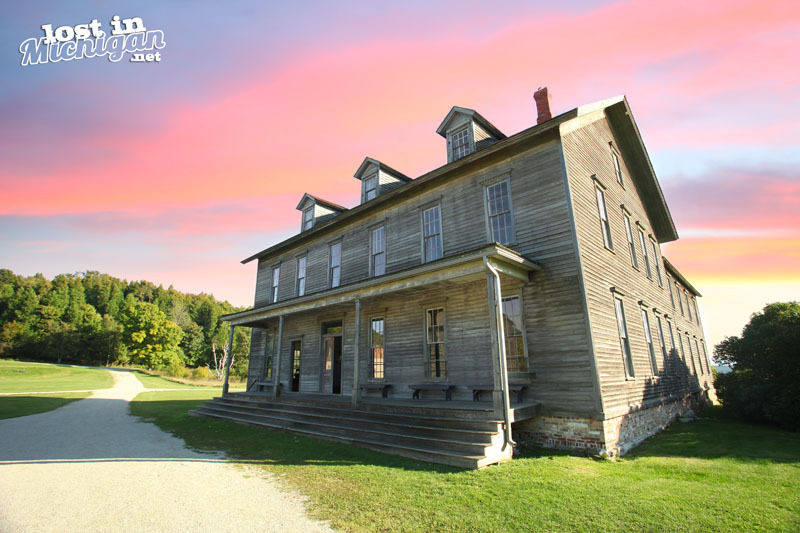 Started in the 1880s, near Empire on the shores of Lake Michigan, the town of Aral was a small lumbering community. Charles Wright managed the sawmill and was known for his short temper and willingness to fight. In August of 1889, the Sheriff sent a deputy and treasurer to collect on taxes the sawmill owed to the county. Mr. Wright met the two men as they came into town and after a short argument he shot and killed both of them leaving their bodies lay in the street. He went back to work at the sawmill as if nothing happened. He must have gotten word from someone that a telegraph message was sent back to the sheriff of the men’s murders. Charles Wright shut down operations for the day and then disappeared into the nearby forest. When the sheriff and a posse of 20 men showed up in the little town of Aral, they found Wright’s native American handyman Peter Lahala, and tied a rope around his neck. They threw it over a nearby tree and pulled him up then lowered him back down trying to get him to disclose the whereabouts of Charles Wright. A the start of hoisting Lahala a third time, two men marched Charles Wright out of the woods and he was taken into custody. 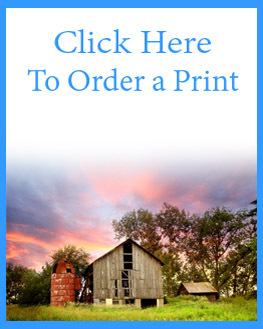 Posted on February 10, 2019 by Mike Sonnenberg Posted in Barns and Farms, Ghost towns	. On the corner of Alicia and Bishop roads in Saginaw County was the town of Alicia. 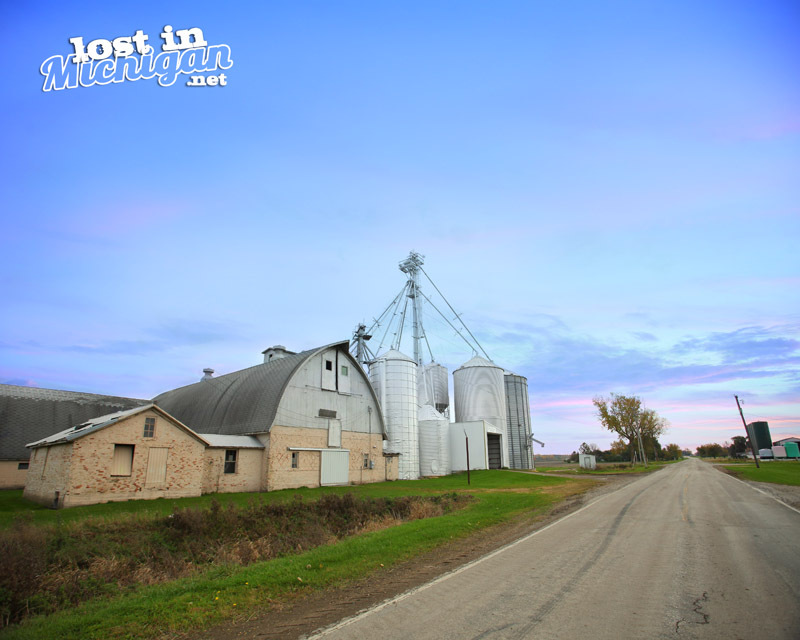 It was the largest town in the Praire Farms which at one time was the largest farm in Michigan. The Town was named after William Lewis Claus’s oldest daughter. Mr. Claus was the chairman of the board of Pittsburgh Plate Glass who owned the Prairie Farm, and the town was where most of the hired workers and their foremen lived. A generator and water plant provided electricity and water to the town that included 80 yellow framed cottages, a general store, a boarding house, dance hall, and several large barns and other buildings for machinery and wagons. A large grain elevator and mint distillery were situated on a spur track connecting the farm with the railroad six miles away. The population would grow to about 350 workers in the summer, and then about 75 in the winter. The post office opened in 1904 and closed in 1947. Posted on December 9, 2018 by Mike Sonnenberg Posted in Ghost towns	. 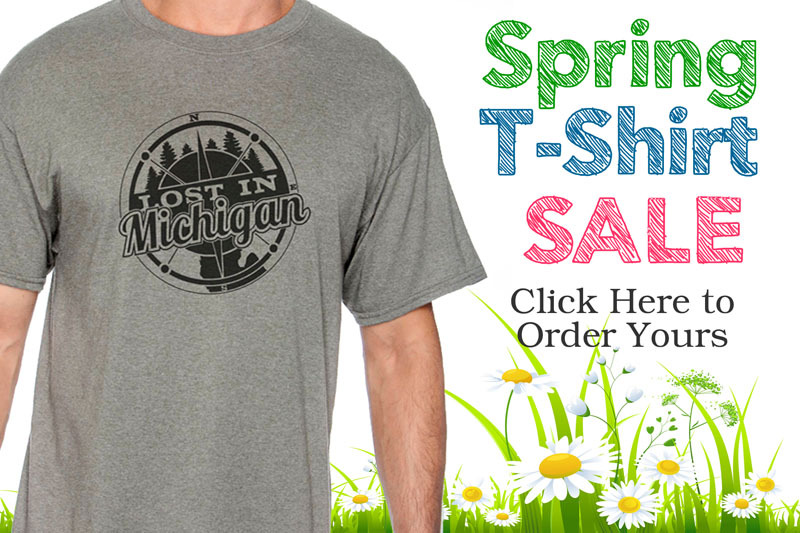 A few miles southeast of Baldwin, in the center of the Lower Peninsula, the Great Northern Portland Cement Company constructed a cement plant In the 1890s to produce cement from marl harvested from a nearby lake. Hence the town of Marlborough was created for the workers. Production boomed, and by 1905, Marlborough had 400 citizens. However, problems quickly arose, as the produced cement was inferior, production was costly, and the enormous energy demands of the plant required the construction of the largest power plant in the Lower Peninsula at the time. The Great Northern Portland Cement Company entered receivership in 1906, and the village houses were sold for salvage. The plant was dynamited for scrap iron, and by 1910 only the ruins of the plant remained. 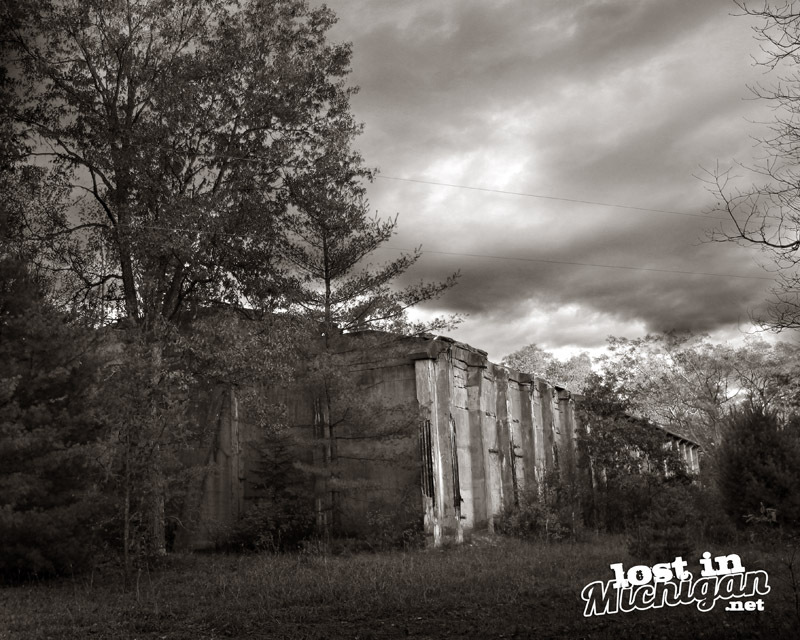 An enormous concrete building still stands near the road along with a labyrinth of concrete walls that are slowly being consumed by the forest. 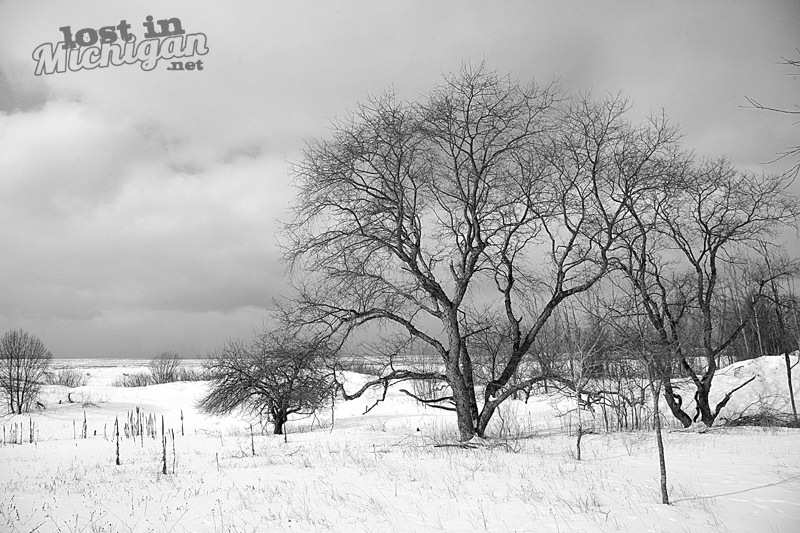 It was designated a Michigan State Historic Site in 1971. Posted on November 16, 2018 by Mike Sonnenberg Posted in Ghost towns	. P.S. I went for a drive today in the early morning snowfall on a cold November day. Somehow I ended up where the old town of Melbourne once stood near this old pump shack that is slowly falling down. Posted on November 10, 2018 by Mike Sonnenberg Posted in Ghost towns, Schools	. 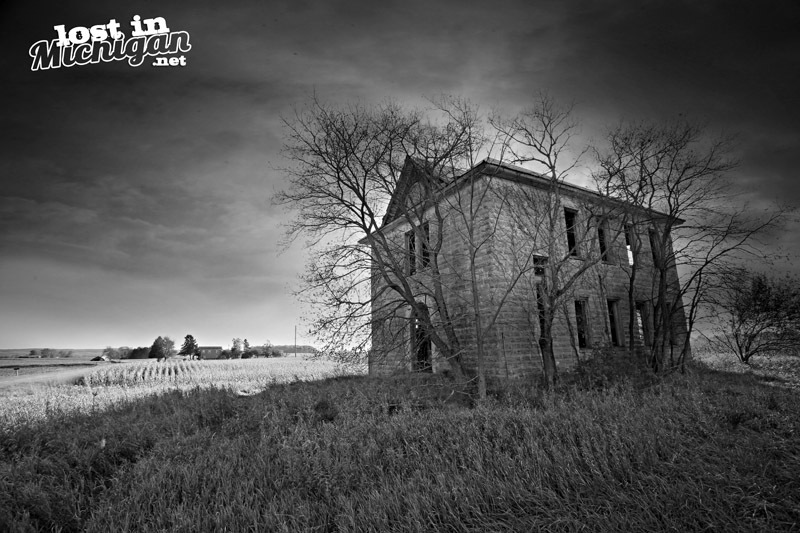 In the rolling farmland of Mason County, the ruins of this two-story schoolhouse stands along the road watching the farmers work the fields. Above the entrance is a carved stone that reads: FERN SCHOOL DIST. 3 1906. It’s all that remains of the town of Fern. The town was built around a sawmill owned by J.S. Adams in Eden Township. A station was built on the Mason and Oceana railroad in 1886 and in 1888 It was given a post office. I am not sure why it was named Fern, but the town must have prospered to build a two-story brick schoolhouse, considering most if the school houses I see left standing are simple single-story wooden structures. A year after the school was built the towns post office closed. Probably because the Post Office switched to its rural free delivery system. 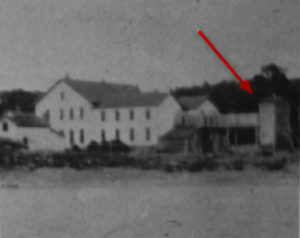 After the timber was gone, the mill must have closed along with the train depot, since there is no longer any tracks running near the old forgotten school. The school closed in 1959 and it stands eerily empty remembering the days when the children of Fern came to visit. Posted on October 23, 2018 by Mike Sonnenberg Posted in autumn, Ghost towns	. I took another whirlwind road trip over to the west coast of the state. I needed to some pics for my Camp Michigan project (HERE is a link if you are interested) After visiting Ludington and Pentwater I took the backroads towards home in the central part of the state. As it always does, the earth rotated away from the sun and it was getting dark so I got on US-10 and was heading east and I came to the area where the old logging town of Nirvana used to stand. Nirvana was originally platted by Darwin Knight who became the towns first postmaster in 1874. He built the town near the Flint & Pere Marquette Railroad. I am not sure if Mr. Knight was Buddhist but he must have been fond of its beliefs. He gave the town the name of Nirvana which is the name of Buddhist highest heaven. He named the town’s hotel The Indra House, after Indra, the principal god of the Ayran-Vedic religion. When timber was king, eleven sawmills operated in the town. But like most of the towns in the area, once the timber was all cut down the sawmills moved, along with the people who worked at them. Other than some of the people resting in peace in the local cemetery, I am thinking nothing remains from Nirvana’s timbering days. 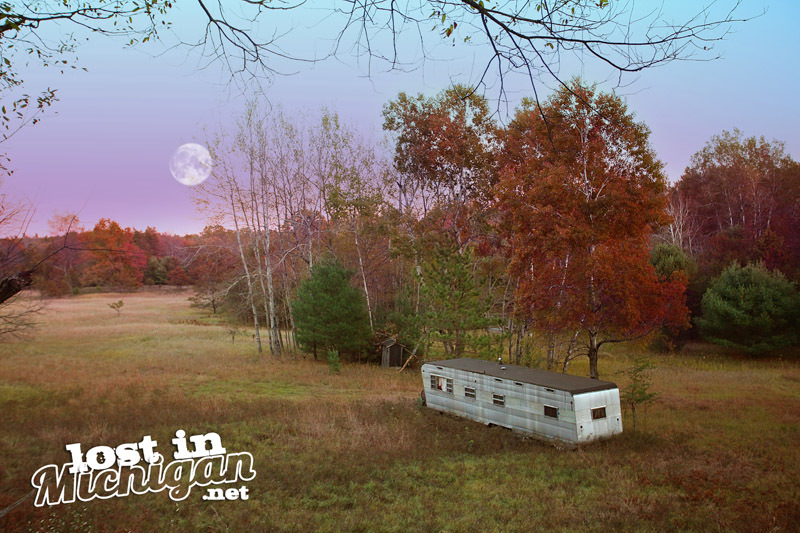 In Cherry Valley Township where Nirvana once resided, I saw this old trailer with the moon rising over the trees, I guess there still is a little bit of nirvana in the area with such a peaceful scene to end a long day of traveling the beautiful Mitten State. Posted on October 21, 2018 by Mike Sonnenberg Posted in Churches, Ghost towns	. 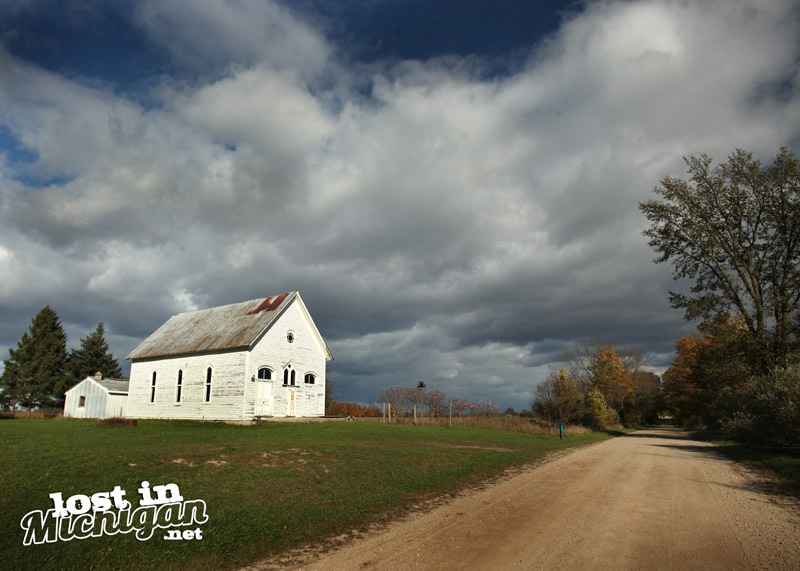 In the farmlands, northeast of Gladwin, stands an old church on a lonely dirt road. The people of the little lumber town of McClure worshiped in the wooden church. 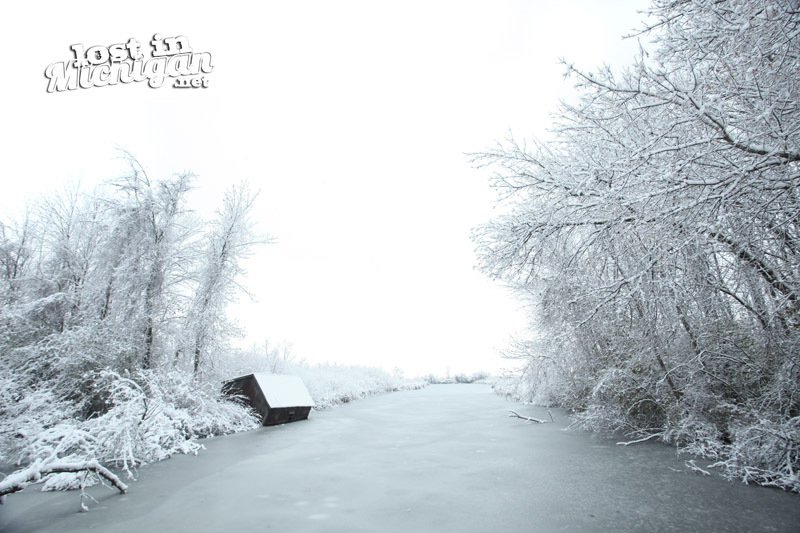 It’s about all that’s left of the town named after lumber baron William C. McClure who built a sawmill in 1883. After the trees were cut down it became a sleepy little farming community, and the church, which is now the Lighthouse Prayer Chapel, still marks the spot where the town once stood. I always think of how hard it must have been for the farmers to pull stumps from the fields. Before the giant hydraulic equipment we have today, it must have been extremely difficult backbreaking work. Time to announce the winner of the Facebook Lost In Michigan Volume 2 book giveaway. Congratulation to Collene Michael she is the winner of the book giveaway. please email me your shipping info to mike@huronphoto.com and I will send out your book.